Magento and Dynamics GP are two very powerful systems, each capable of driving incredible benefits to a business. SalesPad, on other hand, amplifies the power of the Dynamics GP system, both, by making it easier to use GP and execute tasks faster, and by extending it to do things that were not possible earlier. Now imagine all the amazing things a business could do, when these three systems work in tandem with each other. i95Dev, owing to the space we operate in, has had the privilege to help and see businesses achieve amazing things by making these three systems work together – yes by integrating Magento, SalesPad, and Dynamics GP ERP system. In the article, we will look at some of those use cases and understand how these businesses are differentiating themselves from competition. Magento is where all the product, inventory, and pricing information are used (when customers browse your e-commerce store). One of our clients, a leading distributor of music equipment, uses SalesPad to create products, update product information, manage inventory, and to create customized pricing rules in Dynamics GP. This information synchronized to the Magento e-commerce store (and from there to other channels like eBay and Amazon). This helped them sell across multiple sales channels (like e-commerce, eBay, Amazon, etc.) with little incremental effort. The company now manages all information in one single system and automatically synchronizes updates to other systems. This also dramatically reduced the errors that they earlier encountered because of manual data entry. Dynamics GP is the system where the orders are fulfilled, inventory deducted, and accounts updated. One of our clients, a prominent importer and distributor of immunoassay products, uses SalesPad to authorize payments before an order is accepted in the Magento e-commerce store. One of the biggest advantage of this was the client’s e-commerce store no longer had to be PCI Compliant. The client could still take care of its customers’ security concerns, by authorizing and accepting payments in SalesPad, which was PCI Compliant. Another customer, operating in the religious institution industry, leverages Magento to accept orders (and authorize payments). Once the order is placed, the order information (including authorization token, customer’s credit card information, etc.) are synchronized to the Dynamics GP and SalesPad systems. This enabled them to auto capture payments once the order was fulfilled, initiate refunds for returns; accept new orders via phone, and more. Dynamics GP handles orders fulfillment, inventory management, and accounts status. One of our clients, a leading distributor of toys and baby products, took pride in their short order fulfillment cycle. They loved delighting their customers by fulfilling orders as quickly as possible. They automated the entire order fulfillment process to achieve this. Once an order is placed in Magento, the order is automatically synced to the SalesPad and Dynamics GP systems for fulfillment. In SalesPad, they have custom workflows setup that automatically split the order into two – one for items with inventory that can be fulfilled immediately and one backorder for items with no inventory. The backorder is fulfilled when the inventory is available and relevant information is sent back to the Magento system to update customer information with the order status. Another client, a leading provider of educational products, took things one-step further by automated shipment and invoice creation in Magento based on order status in Dynamics GP. The integration also ensured that the customer is informed about the order status and shipping tracking number without any manual intervention. A customer, operating in the religious institution industry, catered to customers across multiple channels (including e-commerce, radio, and television) and had a different order workflow for each channel. The client used SalesPad to configure these workflows. By integrating Magento, SalesPad, and Dynamics GP the client was able to synchronize orders from e-commerce to ERP and push them into a specific workflow for fulfillment. With no manual intervention to execute this, this institution now has time to focus on their operations. Dynamics GP is the system where the historic and updated information related to customer, product, inventory, order, etc. is present. A client, a leading manufacturer and supplier of deuterated compounds to researchers around the world, used Magento to accept orders, Dynamics GP to manage product and inventory information, and SalesPad to streamline order fulfillment process. With Magento, SalesPad and Dynamics GP integration, the customer was able to service their customers better by automating information sync from Dynamics GP and SalesPad to Magento. This helped them keep their customers informed about order status, shipping status, pending invoices, etc. without any manual intervention. A customer, prominent importer and distributor of immunoassay products, uses SalesPad as a customer service tool to update customer information, take orders, view and raise invoices, and more. 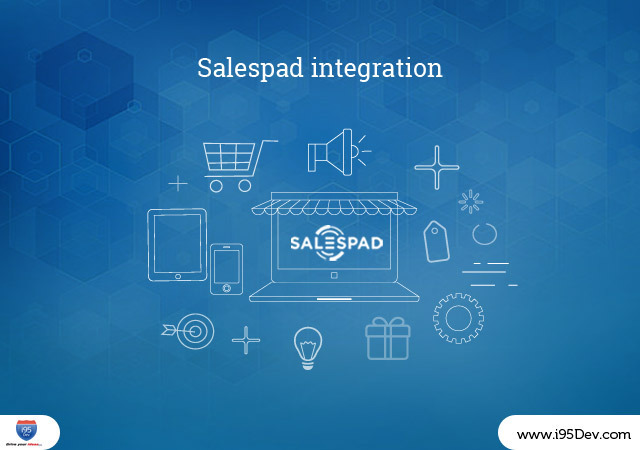 The Magento, SalesPad and Dynamics GP integration has helped them centralize all customer, product, inventory, and order information thereby helping them service customers better. The centralized access to updated and accurate information from multiple customer touch points helps them provide omni-channel experience to their customers. For example, their customer service team now uses SalesPad to answer customer queries related to orders placed in Magento, their customers can view all order and invoice information directly in the Magento e-commerce store, including information for orders placed through customer service representatives (converting their e-commerce store into self-service customer portal), etc. So, how are you planning to leverage the combined power of Magento, Dynamics GP, and SalesPad? i95Dev is a Magento solution partner with a decade of experience in helping wide range of Magento users implement and integrate their ecosystem. We have worked with all popular ERPs including Microsoft Dynamics GP, NAV, AX and 365.